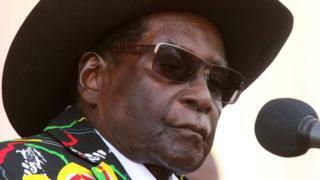 Zimbabwe is to build a $1bn (£770m) university dedicated to the man accused of leading his country to the brink of economic collapse, Robert Mugabe. Jonathan Moyo, minister of tertiary education, told reporters it was a fitting tribute to the 93-year-old president's "commitment to education and his exemplary leadership". It is unclear where the money will come from in a country where unemployment and poverty is endemic. Economic output has halved since 2000. Last year, more than four million Zimbabweans were in need of food aid due to drought. The country was once known as the breadbasket of southern Africa. Despite this, the cabinet has agreed to spend $800m building the new university in Mazowe, 35km (20 miles) outside the capital Harare. Another $200m has been set aside for an endowment fund for research and innovation at the Robert Gabriel Mugabe University, which will focus on science and technology, Mr Moyo said. He would not be drawn on where the funds were coming from. The announcement of the new university was met with derision from opposition parties, which hope to end Mr Mugabe's 37-year reign at next year's general elections. "This is populism that defies logic," said Obert Gutu, a spokesman for the Movement for Democratic Change (MDC). "It is meant to stroke Mugabe's ego because we know this government is broke." Zimbabwe already struggles to pay for education - as well as public services and infrastructure like roads and hospitals - spending 90% of the country's annual budget on wages. The MDC says the money would be better spent on Zimbabwe's existing universities, where students face crumbling infrastructure and a lack of accommodation. According to state media, Mr Mugabe has seven earned degrees and 11 honorary degrees. He is a trained teacher and after coming to power in 1980, his government massively increased the provision of state education to the previously disadvantaged black majority. Zimbabwe recently had the highest literacy rate in Africa, at 90% of the population. Mr Mugabe's wife Grace was awarded a controversial PhD from the University of Zimbabwe in 2014.